Whirlpools??!! These are things which you only read about or see in movies. Never imagined that I would actually go out in a boat to try and spot them with my own eyes!! Depending on the change of tides, the whirlpools will vary in size. They tend to be larger in summer as compared to in winter and are largest during spring tides, which occur every two weeks. 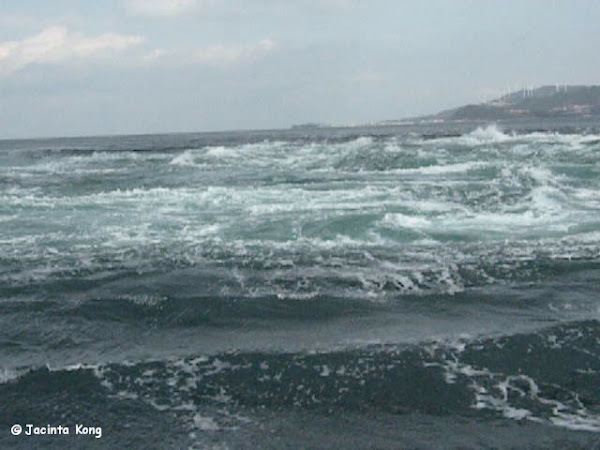 Under optimal conditions, whirlpools of up to 20 metres in diameter can be observed. If your timing is bad and you visit outside of the peak times, you may not get to see any. There are different boats which you can ride on to get to the whirlpools. We boarded the bigger boat called the “Wonder Naruto” (わんだーなると), which is operated by Uzushio Kankosen, for a 30min tour to see the whirlpools. 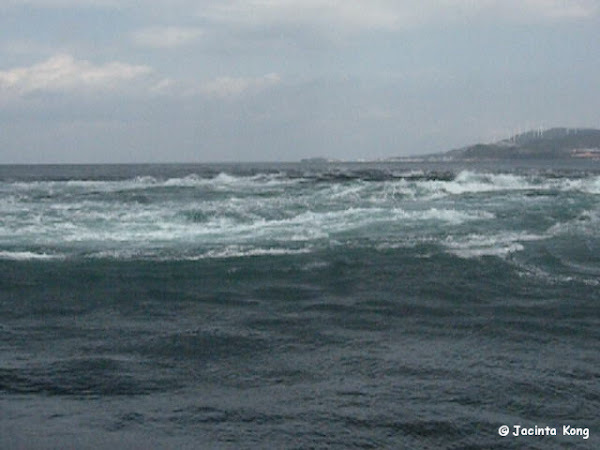 Under the ONaruto Bridge (大鳴門橋) between Awaji Island (淡路島) and Shikoku (四国) where the currents collide…..
Can you see the whirlpools? They aren’t very big since it’s not really the right season to see them. Before you decide to hop onto a boat to go out to see the whirlpools, it’s best to check the Whirlpool Schedule first, in order to ensure that you’ll get to see something! The boats operate on fixed schedules so you’ll need to check which are the best viewing times which coincide with the boat schedules before you book your boat tickets. Awaji Island (淡路島) has some interesting ice-cream flavours and I discovered this when I was travelling from Shikoku (四国) to Kobe (神戸). 2nd row from left: Awaji Island ice-cream (not sure what flavour that is), Naruto sweet potato ice-cream, ONION ICE-CREAM!! Unfortunately we had just finished lunch and didn’t have room in the stomach for anything else so I didn’t buy any to try. Anyway, I’m not a fan of onions so I don’t think I’ll ever try that flavour! The Ritsurin Koen Park (or Ritsurin Garden) is one of the most famous and most beautiful historical gardens in Japan. Unfortunately, we only had about one hour at this place as it was one of the stops included in our tour package. Gosh…so much ground to cover and so little time!! Lovely koi in the pond…. Spotted this bridge which was a sharp contrast to its surroundings.